An Open Letter to Diners, Restaurants & Pancake Houses of Michigan: We Want Real Maple Syrup! I don't know about you, but we eat out a lot. Not a lot-lot, but enough to say, it's frequent. We're fond of breakfast. The only meal of the day that I really feel like it's ok to indulge. After all, you have all damn day to burn it off, right? And since I've had breakfast everywhere within 5 miles of my house, I'm amazed at how 9 out of 10 restaurants don't have real maple syrup available for purchase when you order your short stack! What gives? So here's my letter to you: the diners, the restaurants and the pancake houses of Michigan. We want real maple syrup! We want it! MA! We want meat loaf! Sorry ... I had to. I love your pancakes, your french toast, your crepes and your bacon. But when I come to eat at your establishment I get really sad when you don't have real maple syrup. It's not that you need to give it away for free–that stuff doesn't grow on trees, I know. Well, it does grows OUT of trees so, yes, it's an expensive labor intensive commodity. My point is, people like me: the hippie types, the au natural types, the foodies–we want real maple syrup with our pancakes. And we're willing to pay for it. $2-3 per plate in my estimation as I've paid that much, and I was happy to do it. You see, real maple syrup, once you've had it–can't be substituted with the fake stuff. Once you taste that real unadulterated rich maple flavor, nothing else will do. And it turns out that we live in a state with an abundant supply of locally made real maple syrup. It can be purchased by the gallon and marked up 50%. Helping you to cover the costs and make a buck or two. Because real maple syrup has been made for hundreds of years in cold country. It's rich in sugars and minerals that nourish the body and bring amazing sweetness to all sorts of foods we love. Because it's a natural and minimally processed substance, it's easy for the body to assimilate and metabolize. Fake maple syrups made with high fructose corn syrup and other processed ingredients are not easily recognized by the body. They disturb blood sugar balance, hormonal balance, and in some cases are really toxic! Skip the fake stuff and go for the real deal whenever possible. There's a reason we've eaten this so long without detrimental effect. It's all natural. It's nourishing. It's cold country sugar! This isn't a chore, it's an opportunity! Buying maple syrup to serve in your diner or pancake house is a chance to stimulate Michigan's economy. An opportunity to offer the best of the best to discerning patrons and to increase the amount spent on each check requiring this sweet nectar of the gods. Theoretically, this also makes for higher tips to your waitstaff too. Win, win, WIN! Offer real maple syrup on your menu when possible. I look for it, others will too! Don't want to reprint your menu? Simply have your staff offer it verbally with any order of pancakes, french toast or crepes for an up-charge. It will generate a high-end yet simultaneously "down home" feel to your business that sets you apart from the pack. Trust me–I know where I can get real maple syrup in New Orleans, Charleston and other cities I've visited. Making real maple syrup available offers what is truly healthful to the body AND tantalizing to the taste buds. Stimulating the economy of everyone involved is maple syrup on the pancake! Thanks for reading. Thanks for considering this. And most of all, thanks for feeding us. 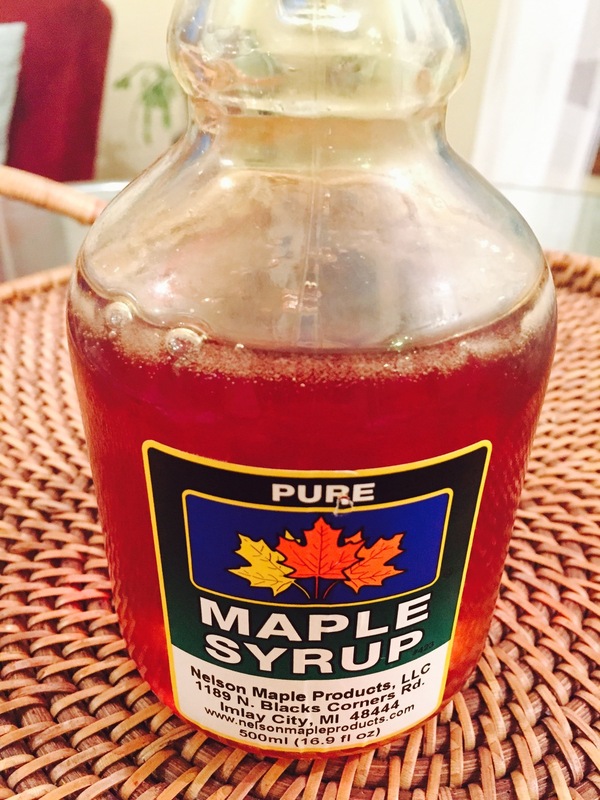 Link to Michigan Maple Syrup Producers - ask for a bulk discount!